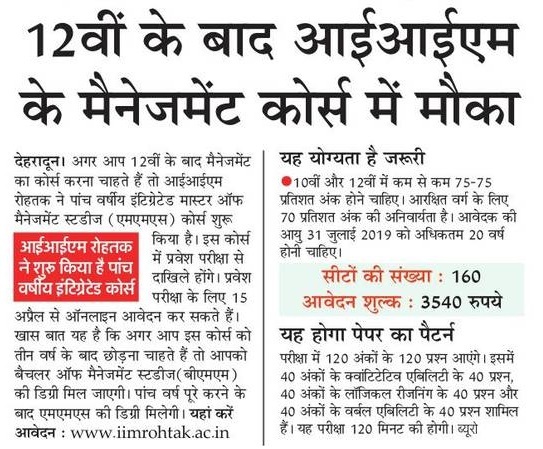 IIM Rohtak MMS Management Course after 12th: Many Students have dream to join IIM (Indian Institute of Management) after 12th in any management course that can make their career in bright mode. So we are here to tell you about IIM MMS Course After 12th which is 5 year integrated course. 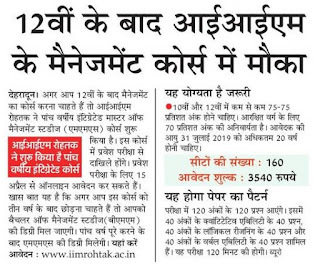 This Latest news is of 14 April Registration started to fill IIM Management Course 160 seats before last date of May 2019. IIM Rohtak MMS Admission Form 2019: In this Course only entrance exam will give you seats in IIM Rohtak Management Course during counseling and seat allotment. From 15 April 2019 through all India basis IIM rohtak is conducting exam of IIM Rohtak MMS 2019 Online Form. Benefit of 5 YEARS of Integrated Course Degree: The best thing of COMBINED 5 years (Bachelor+ Master Degree) is you are free from all types of entrance given two or three time to get college. 1.2nd things are you have only one target of single stream, search new jobs according to that stream. 2. You don’t need to waste your time every year. 3. You 5 year degree is also called Bachelor Degree + PG Degree. 4. After 3 years completing you can apply in any government jobs.